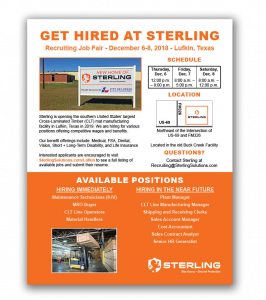 Sterling will host a recruiting job fair for potential employees December 6-8, 2018, at its new TerraLam® Cross-Laminated Timber mat production facility in Lufkin, Texas. Interested applicants should visit SterlingSolutions.com/Lufkin to submit their resume in advance so the Sterling team can review and contact them for scheduled in-person interviews during the recruitment fair. Sterling is currently looking to fill 20-25 positions immediately and will begin interviewing for an additional 60+ positions that will be filled in the near future. All available positions are listed at SterlingSolutions.com/Lufkin and will be updated as new positions are posted. Click here to download the Recruiting Job Fair Flyer.